There is a lot more to the Haunted Mansion than meets the eye, of course. In order to make such an involved attraction operate so flawlessly, numerous control systems, offices, and storage areas are employed throughout the show building. All of the complex Disney theme park rides have some sort of control room and many systems in operation to make everything work smoothly so that guests have as few interruptions as possible. 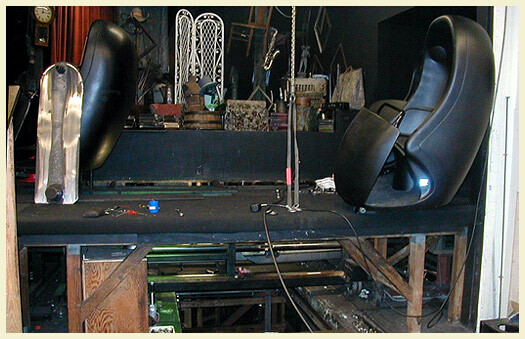 Pictured at left is a representation of the Haunted Mansion's Omnimover track, this time from Walt Disney World's Haunted Mansion. 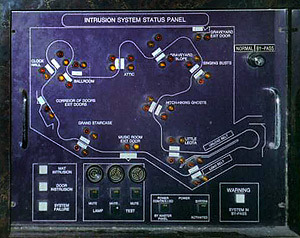 This is a photo of the ride's sophisticated intrusion alarm system, which monitors exit doors and pressure-sensitive mats throughout the ride. Unwary riders who think it may be fun to ditch their Doom Buggies inside the ride will find that the entire track of carriages may come to a standstill as they trigger the various intrusion alerts. Imagineer Tony Baxter talks about the role of the Cast Member in making the magic of the Haunted Mansion real. Of course, the true heartbeat of the Haunted Mansion is the cast members, and it is their stories and information that make a look backstage so interesting. "Since its completion, Disneyland has been inviting ghosts from all over this world, and the next, to move in for "active retirement. Latest population figures show that there are 999 residents at home in the Haunted Mansion, and they are always looking for #1,000 which might be any volunteer brave enough to enter. "Ghost residents are a potpourri of supernatural, occult, psychic, and historical types, ranging from Egyptian and Roman, to Napoleonic and Dickens era. There is also an assortment of fluttering bats, talking ravens, screaming banshees, owls, cats, and baying hounds..."
Click here to read a transcript of the entire 1975 handbook. For those of you with an eye toward extreme Haunted Mansion trivia, you can click here to download a schematic diagram of all of the lighting effects used in the entire Haunted Mansion attraction. This chart will show you where each and every light bulb, UV tube, and lighting effect is located throughout the ride. Pictured above is a lights-on photo of the Doom Buggy track in the attic during a ride rehab. Haunted Mansion cast members have a special checklist which details each and every property or mechanical control in the attraction that needs to be checked at the end of the day - down to every "raven, door-knocker, and moving tomb lid," according to this list dating back to the '80s. Download all four pages here. "When I worked at the Mansion, there was not a lot of time to play around cause of the constant work. I would, however, have times that I could play around. I usually had a great time playing with the greeter at the Mansion and playing off one another...I had a thing where I would stand non-smiling, staring straight ahead. I would pick one person coming out of the Mansion and I would follow them with my eyes like in the paintings in the attraction. You would be amazed how many people would notice a small detail like eyes just moving! This freaked people out and I could hear them laughing when they noticed it. "Another thing I would do was to juggle the eyeballs (which were plastic souvenirs for sale - Ed.) I can juggle okay, so I could throw them under my arms and around. This always led someone to ask "How do you do that?" to which I would gravely reply, "You keep your eye on the ball." Yeah, sometimes bad jokes are needed." As Rob Z. noted, the Cast Members at the Haunted Mansion can make the experience much more exciting when they act in character. Pictured at right is the infamous Maynard Smith, one of Disneyland's most talked-about attraction hosts. Although Maynard isn't currently seen at the Mansion often, he was once profiled in Disney Magazine due to his fan-pleasing antics, which involved finger-puppets and imaginary friends. "It was unlike a usual day at Disneyland - gloomy and near-rainy. My mother, two brothers, sister and I were at Disneyland on a school day off, and I wanted to meet this "Maynard" person whom I had heard so much about. My mom was tired and wanted to get home soon - tt was about 5:00 and we had been at Disneyland all day. It wasn't a big deal to the rest of the family to go home because of our annual passes, but it was for me. I had moved to California about a year before from Connecticut, and since I was four I was telling my family that we would have to move to California so that I would work for Disney. Disneyland was my place, and I hated leaving, especially this time.
" For over two months I had been trying to get in contact with Maynard Smith, the "Evil Twin" at the haunted mansion. I begged my mom just to go through the Haunted Mansion with me in case he was here. I asked the cast member at the front of the queue - and sure enough, he had just arrived. I asked her where he was in rotation - it was the loading area. My mom didn't want to stay, but for the first time at Disneyland I whined a terrible whine. One we were inside the stretch room, I heard a funny laugh from a cast member: "All the way into the room, please!" My mom looked at me. "That's got to be him," she said. "Go!" I made my way through the croud over to Maynard. "'Are you Maynard?' I asked. I explained how I had been looking for him and was so glad to see him. I also told how I saw him on Disney Channel's "So Weird" marathon. "Ha ha, scaring kids from coast to coast!" he said. Right before the doors were supposed to open, he pulled out his gargoyle puppets and sang, "Keep those bodies rollin'," and "they're coming to take me away." On the way to the omnimovers, he came up to my sister, in a Minnie dress an ears. He said, "Silly mousie, you like MUSIC? Maybe opera music?" He pulled out a little frog and sang, "Figaro! Fiiiiii-garo!" And laughed and walked away. Once I left the ride, I saw him waiting for me with a clipboard outside. He walked up to me a nd strummed his fingers on the clipboard. "Taking the body count." My mom got our picture, and he said to my mom, "I have a present for your eldest daughter." He then pulled form his vest a huge... LEAF! He gave me the leaf and walked away laughing... it was the best Haunted Mansion experience I've ever had. " Disneyland is not immune from common maladies that affect all theme parks. So, when people vomit on this ride, how does that get taken care of? And do you have to be a great actor to be a good Mansion host or hostess? "Enummey," a Walt Disney World Haunted Mansion Cast Member, offers some insight. "I believe that in the past cast members who wished to work in the Mansion had to audition, but that is not the case anymore. I was lucky enough to land a job there because I requested it at my interview and there happened to be openings there at that time. I don't have an acting background, and one is not necessary. "During training, the main objective seemed to be to teach you how to operate the attraction and how to assist guests in various situations. The acting aspect is picked up by observing fellow castmembers, and it is developed over time. "Anyway, when a "spill" occurs in a doombuggy, we try not to stop the ride unless it gets in-between cars. The custodial cast member rides while he or she cleans." Just another of the many joys of serving the public as a Disney Cast Member! The following article is taken from Disney Magazine, Winter 1999-2000. It profiles Maynard Smith, a cast member that achieved a good deal of fame over the years of his employment at Disneyland Park due to his extreme characters and various Disneyland-only personas. 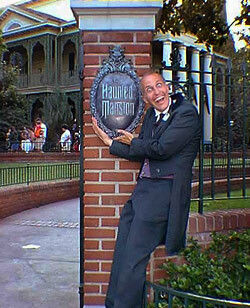 He is probably most famous for playing "Evil Twin Maynard" as a cast member at the Haunted Mansion. Click here to read the article. The following article is taken from Disney Magazine, Spring 2005. It discusses a new tour that was offered at Disneyland Resort called Disney's Mysteries, Myths and Legends. The tours were offered by "otherworldly" tour guides by the name of "Gracey" (or "Gracie," should the guide be female), which was a reference to "Master Gracey" of the Haunted Mansion. The tours always ended up at the Haunted Mansion as the park closed, and guests of the tour would be able to ride the Mansion for its final round.. Click here to read the article.